Support and help the programs, projects and activities of ARALPINOY.ORG INC, a non-stock, non-profit and non-partisan organization registered under the laws of the RP on August 11, 2010 with SEC CRN CN201012580 and BIR TIN 007-842-097. For any help, please notify us at ingles.antonio@gmail.com or 09178661006 Maraming maraming salamat po! An Act prescribing the code of the national flag, anthem, motto, coat-of-arms and other heraldic items and devices of the Philippines of 1998, S. 25 & 40. (1998). In the New Testament (NT), Paul describes the Kingdom of God as, “...not a matter of food and drink, but of righteousness (justice), peace, and joy in the Holy Spirit” (New American Bible, Romans 14:17)." In the Old Testament (OT), the Hebraic Covenant Theology best translates justice concept as "Right-Relations" or even better as "Life-Giving Relationships" (Fuellenbach, 1998). This "Life-Giving Relationships" as value can be associated with the concepts of harmony, wholeness, caring, compassion, reciprocal regard, and mutual valuation of intrinsic worth (Acorn, 2004). According to Fuellenbach (1998) to be just means human beings should live in life-giving relationships in the following holistic essential relations in four directions or the fourfold relationality: (1) with their fellow human beings, (2) with themselves, (3) with nature (creation) and (4) ultimately with God (p. 195). Life-Giving Relationships is also referred to as Holistic Relationality. The basic notion of ‘relationality’ is referred to as the essential relations that extend in four directions or fourfold relationality, namely to God, to oneself, to neighbors (both referred to an individual and individuals who are part and parcel of a society) and to creation as a whole, while the basic notion of ‘holistic’ is referred to every position of truth that we hold, which represents just one part of a larger truth (Koukl as cited in Ingles, 2006). Likewise, I also borrowed Arthur Koestler’s ‘holon’ to refer to “any entity that is itself a whole and simultaneously a part of some other whole” (Mairesse as cited in Ingles, 2006, p. 32). The following are the four independent studies with fourfold relationality:Fuellenbach (1998): (1) with their fellow human beings, (2) with themselves, (3) with nature (creation) and (4) ultimately with God; Nagahama (2006)/ Hornedo (2009): (1) Makabayan (Love for Country), (2) Makatao (Love for Humanity), (3) Makakalikasan (Love for nature) and (4) Maka-Diyos (Love for God) and Ramirez (2009): (1) Pro-Country (Maka-Bayan),(2) Pro-People (Maka-Tao), (3) Pro-Nature (Maka-Kalikasan), and (4) Pro-God (Maka-Diyos). Fuellenbach, J. (1998). Throw fire (2nd revised edition, 8th printing). Manila: Logos Publications. Ingles, A. (2006). 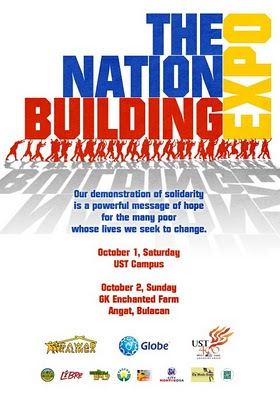 Nakakaluwag: An affirmation of a vision of persons living in peaceful harmony and with respect for life and dignity. Ang Makatao, 32-43. Ramirez, M. (2009). Transformative education in the context of a globalizing world. The ASI Option , 17-23. 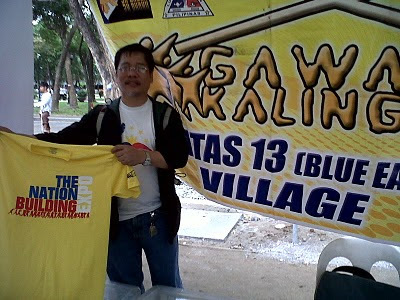 Out of the blue I got a message last August 30, 2011 from Jay Jaboneta [https://www.facebook.com/jay.jaboneta]: "Thank you for the support Sir!" Then I simply replied to him: "You are an inspiration to young people, to my students... Keep up the best work, be the best..." And he added: "Thank you Sir! Would love to share our story with your group [http://yellowboat.tumblr.com/about]." 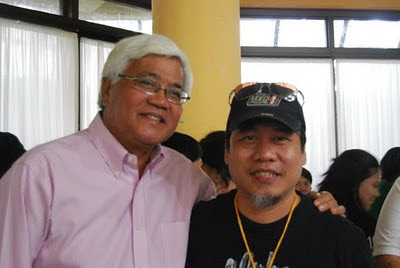 I was so grateful to his gesture, so I said: Thanks for the offer, I will already schedule your talk to meet my students come 3rd week of September (",)... but I have nothing to offer you except appreciation... And apologetically, he said: "If I am free Sir I would go as long as it's within Manila." is born (DLS-CSB HF12 2011). The students' baon (allowance) for a day, when put all these together, is already a livelihood for a family... Sir Dong is very grateful (Mr. Justino Cabarles, Principal I, Regional Planning Office, DepEd Region V [https://www.facebook.com/profile.php?id=100002336880602]). He said, "Thanx so much. i hope I could post this boat the soonest time possible... Please convey my thanks to your students in behalf of the yellow boat community. 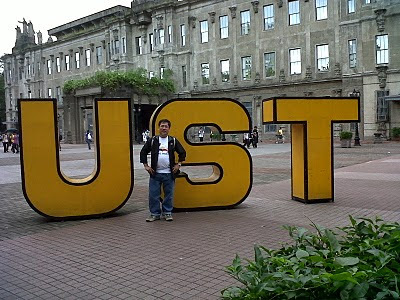 Thanx to you also, Uncle Antonio...[https://www.facebook.com/inglesantonio]" Jay is also thankful: "Wow! Thank you so much Uncle Antonio! This is a simple but heroic part on the part of the solutions - this is the kind of attitude we really want the youth to learn and show." Then I replied: "Thank you in advance Jay...", so I asked: "By the way how do you know I'm supporting your mission?" He said: "I saw you like one of the things we posted hehe, Thank you again Sir!" And I replied: "I should be the one thanking you...", then I encouraged him: "Be a hero-virus and keep spreading and infecting us with you viral-heroism..." With humility he replied: "I hope to be able to do that Sir. Maraming salamat!" I further encouraged him: "You have already started it and infecting us... Being grateful, he said: "Glad to hear that Sir. God bless and hope to meet you soon." Finally, I ended our conversation telling him: "God bless you more... and see you soon!" The beneficiary of the Yellow Boat is the family of Edwin Bono, who worked so hard during the installation of the water pipes from Guinhadap to Mababoy Island. He also took charge of piling sacks of sand to prevent the hose from breaking due to docking motorboats. And become the hope that I can be. And start the change I long to see. The change that begins in me. Live Jesus in our hearts forever! This is what Bayanihan Spirit is all about... a Filipino Value of a family/community unity effort of HF12 to achieve a life changing purpose and objective... Congratulations! 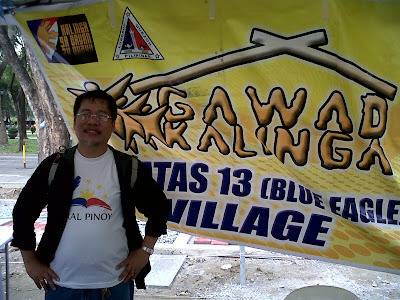 Help us get One Aral Pinoy Boat on the waters of Masbate. They need more boats @7k per boat. 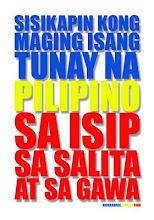 c/o Dr. Ofelia Samar Sy / Pinoy Power Bicol Coalition Inc. Please PM her first before depositing. VICTOR was spending the week-end at our home. he would react to it. "nana why don't we buy a boat for them." HELP ARAL PINOY VIA PAYPAL! 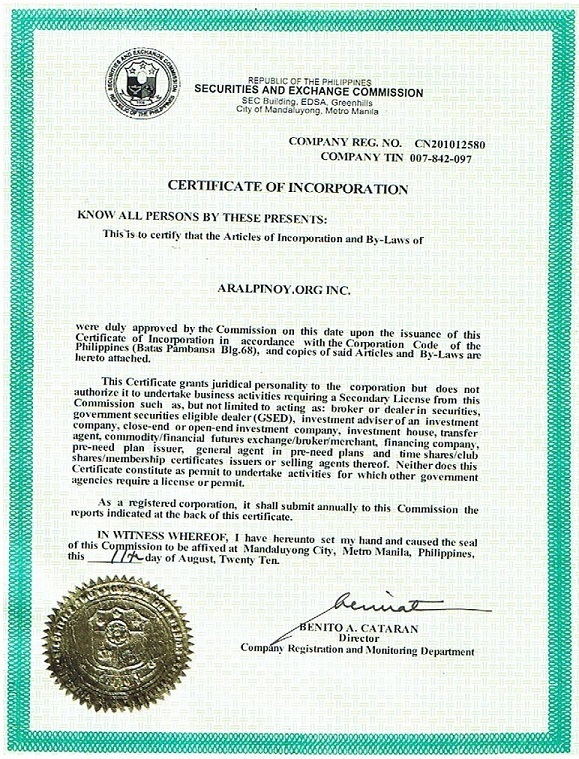 ARALPINOY.ORG INC is a non-stock, non-profit and non-partisan organization registered under the laws of the Republic of the Philippines with the Securities and Exchange Commission (SEC) on August 11, 2010 with Company Registration Number: CN201012580 that can be verified via sec.gov.ph website. 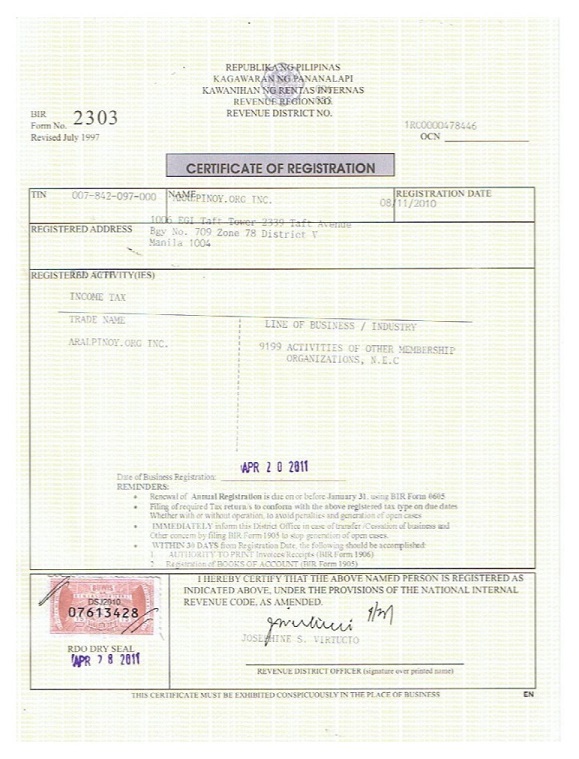 ARALPINOY.ORG INC is a Tax Exempt non-stock, non-profit and non-partisan organization registered under the laws of the Republic of the Philippines with the Bureau of Internal Revenue (BIR) with registration number 007-842-097-000 that can be verified via bir.gov.ph website. 1. Identify schools that need assistance especially those with insufficient instructional materials/equipment and insufficient budget or funds. 2. Train teachers to improve teaching and enhance students’ learning and to assure that the teachers that are trained actually apply what they have learned. 1. Identify partner communities/institutions/corporations that are willing to sponsor a sustainable teacher training programs to schools mentioned above. 2. Design and offer modules/manuals/short-courses to suit teachers with different needs at all levels.